Details: Prior to the meeting and at the same venue there will be an open display from 2.00pm where you will be able to see a demonstration of the new website and an update on the projects that commenced in 2008. 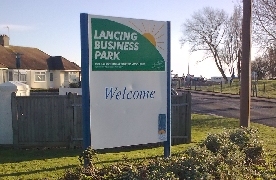 It is also hoped to be able to display the new scheme for signage covering the business park and to receive thoughts and comments on this proposal. The AGM will start at 6.00pm and will be followed by a talk from guest speaker Dave Brooks - Chief Executive of Sussex Contry Cricket.